Looking at the chaos and TuTu-MainMain around Lokpal bill, one wonders if it is time that we have a pan India open debate to set things straight once-and-for-all. We all wanted a strong Lokpal bill; Strong enough to put in more stringent checks and balances to control the corruption in every level. Studying the media reports on the proposed bill of the Government, one wonders, if we really got what we wanted. Did our aspiration of having a serious institution, free from the clutches of the ruling Government being installed to safeguard the national interest and control the rampant corruption that the country is going through, is been fulfilled or not. 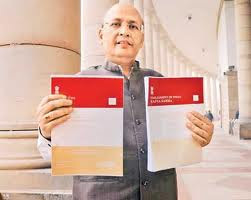 The point of serious difference between team Anna and the Government representatives has got three major issues. The inclusion of PM under the Lokpal. CBI as an independent investigative agency under Lokpal. And finally, the formation of effective citizen chatters. Let’s ponder if the proposed bill of the Government is addressing any of the three concerns with any seriousness or not. The initial demand was to have PM under the purview of the Lokpal at all time. Like me, many see no harm in any such demand. When the PM is already under the supervision of the laws of the land and even under CBI, then what is the harm in having him under Lokpal? But for some strange reasons best known to the gray heads of the standing committee, they want to defer on this popular sentiment as it is evident from the below changes they prescribed from the original demand. PM is under the Lokpal but with conditions. The first point is humorous to say the least. For the life of me I fail to understand why can’t the PM being a citizen of the nation be under the laws of the land without any condition, as an average citizen? Why the PM have to have privileges even when it comes to abide by the laws of the land? This seems grossly illogical to me as our constitution mandates to treat each one of us with same yardstick in the eyes of the law. If I as an individual is under the Lokpal without any condition then why can’t the PM be; More so when he/she is an elected representative? PM not to be questioned on issues of National Security seems genuine, as long as it is clearly defined which precise matters one should consider as matters of National Security. Is there any such list available? The fear of our cunning politicians misusing this clause to safeguard themselves by painting every damn issue under the sun being of National Security nature can’t be ruled out. Given a chance there would be guys who would readily try to project even allocation of spectrum as a matter of National Security and hence the PM can’t be questioned why he let Raja keep on looting. This precise clause is as same as Article-72 of our constitution dealing with Mercy petitions. We know how the political parties have manipulated it to carry on with their appeasement activity. For the third point, I just want to ask – Hell, why not? Why shouldn’t the complains be made public? Doesn’t the nation have the rights to know on what charges their own elected Prime-Minister is been investigated? Where is the issue of conflict of interest that the Government is trying to furnish as an excuse for their decision? Rather, as long as the investigation remains transparent, it will in fact minimize the so called conflict of interest and would stop individuals with nefarious interest from taking advantage of the situation. I am not sure if one should laugh or cry on these points. At the outset one would for sure pity on the brains who thought of such ornamental travesty of commonsense. When the concern was the misuse of the CBI for political gain we see nothing has been done to address that concern. It is still under the Home-ministry with its director reporting to the Home-minister. Now one can guess how effective and fair the agency would be with its investigation while dealing with corrupt ministers of the ruling government. More than the logic, I am yet to get to the crux of such death-may-do-us-apart love of the Government for CBI. For the second point, one can safely laugh out loud and yet be unquestioned on the reasons. How in earth one can conceive the idea of having a corruption crusade independent institution without having its own prosecution wing is beyond my imagination. What the Government wants the Lokpal to do? Break their backs in investigating and unearthing the loot and the looters and then give it to CBI prosecution wing to take it from there and screw up all the hard work at the end of the day? Does the Government want the Lokpal to work like mules to bring the rascals to the light of the day; only for the prosecution to start covering up the mess later? Even the word disgusting is an understatement. No issues with that if the proposed bill never talks anything about it when we have a separate bill already tabled to address this issue. But on the second thought, just wondering; why the hell so many bills are floated when our government in an average takes a good part of four decades to pass one? So in nutshell, the dirty tricks department seems to have their way yet again in safeguarding themselves and some maligned interest of few. The strong Lokpal that would have made sure thugs are apprehended with their pants down is intentionally made toothless. And for once if Sonia Gandhi is half serious on her utterances about fighting for a strong Lokpal as it is a path breaking bill, then why doesn’t she accepts Anna’s challenge of coming out to the open and debate over the rubbish bill her party men have proposed as an output of the so called useless standing committee meetings? Mrs. Gandhi - Are you listening ?? ! !